If you're just joining us after a long night of Europa League football, here's the lay of the land. 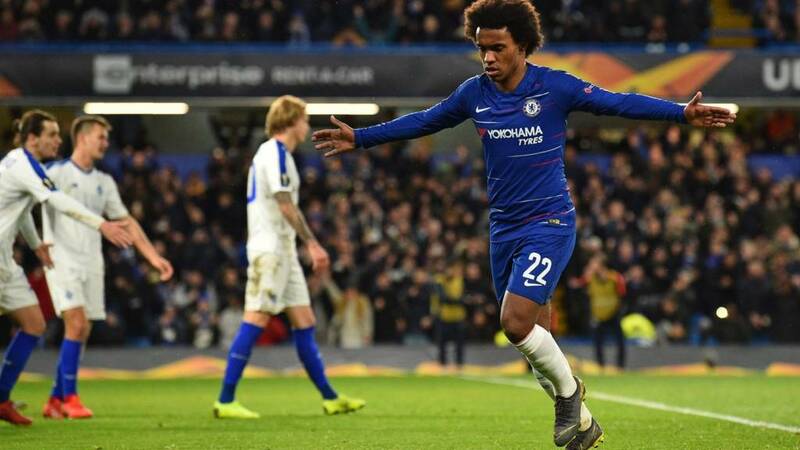 Chelsea are in a strong position to move into the quarter-finals after a 3-0 win at home to Dynamo Kiev. Callum Hudson-Odoi came off the bench to score a late third. But Arsenal have it all to do after they lost 3-1 at Rennes - Sokratis was sent-off too. Here's the Chelsea match report. Read what went wrong for Arsenal here. "I think we played a very good match without conceding and we did very well in the first half. I didn't like the 10 minutes after 2-0, as we lowered our intensity. "The third goal is very important, 3-0 is an important result. Of course we have to play the second leg and be careful." "I think that for us with this kind of opponent we need to play like we did in the first half and be really dangerous. "We expect the second game to be the same kind of match. I think we will need to defend more. 3-0 is a good result. We need to play the second game with same level of attention and application." "Hudson-Odoi is a very important young player but he is 18 and needs to improve. "I don't like if fans or the press put him under too much pressure, at the moment he only has to think to improve. "It is impossible to be at top at 18 and he will be at the top at 22 or 23 like all the other players." Chelsea coach Maurizio Sarri is a happy man, I think. He says that he didn't like the 10 minutes after they went 2-0 up but that's it. Dynamo Kiev have never won a European match on English soil, with the Ukrainians drawing three and losing 12 of their 15 previous visits. "I am happy with the goal but more with the result. "We played well but we need to be more clinical, in the first half could have been three-nil up but we are there and did the job and have to go to Kiev to finish the job. "I like to play against Dynamo since I was at Shakhtar Donetsk. It was a nice goal and the same as when I scored against Kiev two or three years ago." "The game is not finished. It will be difficult and we want to go there and win the game there as well." Kpad: I have been so desperate for a Callum Hudson-Odoi goal assisted by Ruben Loftus-Cheek. This is the sweetest of goals in a long time. I say it is the Bluest of the Blue goals ever!!! Come on Sarri, you have got to play these two more often. "It feel feels good I'm so happy for the team work today and the win was so important and in this competition. "I am happy with the goal but sad with the misses but the most important thing is the result. We have 90 minutes in Kiev and it will be difficult, the game is not closed. But it was a good night for us." "We want to continue this feeling and confidence. It's good for the players, the team and the supporters. From now on every game is a final." Since his Chelsea debut in September 2013, Willian has scored 11 direct free-kick goals in all competitions, more than any other Premier League player. Pedro says that the win is "very important" but laughs off chat that he should have scored more. They do - in pot one for the draw as well! Shaun Thacker: Re: Paul. Think Europa League winners go straight to group stage. Maybe Tom can clarify? A three-nil win, no away goal conceded, a goal for Callum hudson-Odoi, nobody refusing to come off - a good night all round for the Europa League favourites. Keep going Chelsea. Only another seven games to win until you get to the Champions League qualifiers. A fine goal as Chelsea make the most of some rare space and Callum Hudson-Odoi probably puts this tie to bed. Pedro has the ball on the right and hits a booming cross to Ruben Loftus-Cheek wide left, he flicks it inside to the young sub and he takes a touch before firing into the back of the net. Callum Hudson-Odoi has struggled to get into the game since he came on, Chelsea are just seeing this one out now though.